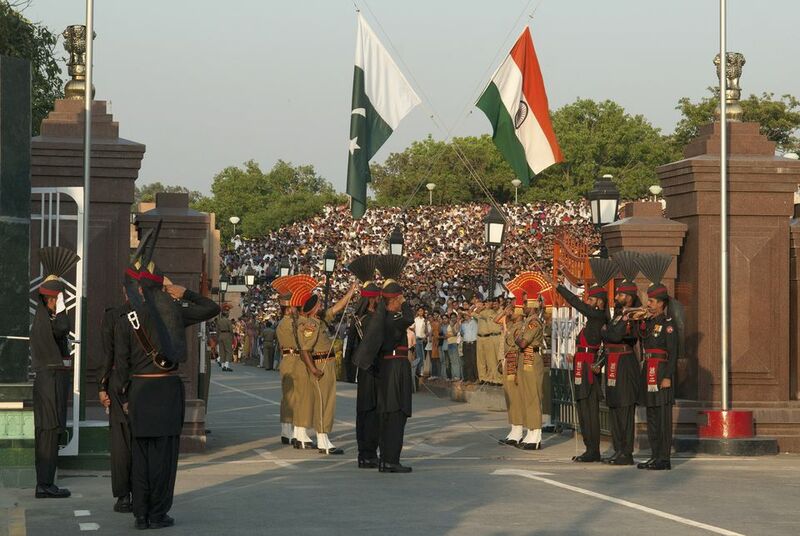 What is the Wagah Border Flag Ceremony? Everyday of the year, just before sunset, a flag lowering ceremony takes place at the Wagah Border between India and Pakistan. The Wagah Border ceremony, formally known as Beating the Retreat, is a popular tourist attraction and side trip from Amritsar in Punjab state. The ceremony has been going on since 1959 and lasts for around 45 minutes. It starts with high patriotic spirits from sides of the border. Soldiers march towards the gate at the border, which is thrown open when they reach there. The soldiers salute each other other and start lowering the flags. The flags are lowered at the same time. The soldiers retrieve and fold the flags, the gate slams shut, and a trumpet sounds the end of the ceremony. The soldiers then return with their country's respective flag. See photos of the Wagah Border ceremony in this gallery, or find out more about it in this guide to the Wagah Border ceremony. 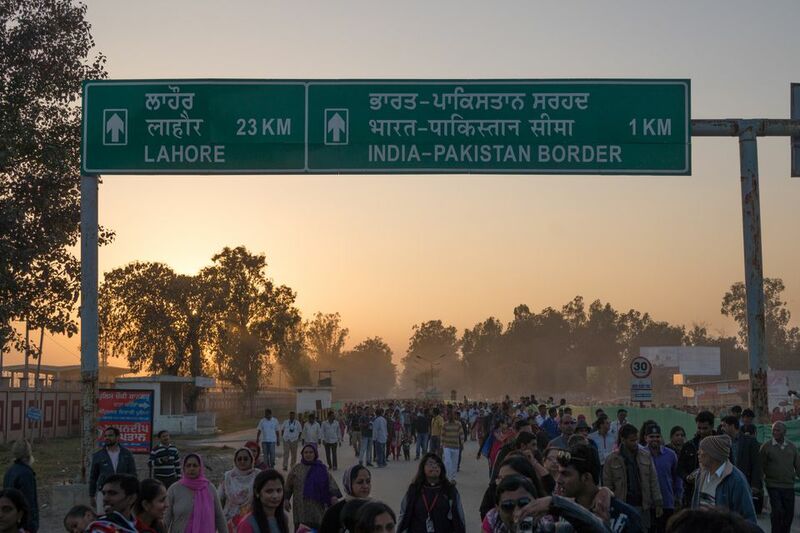 The Wagah border opens without fanfare at 10 a.m. and closes at 4 p.m. or 5 p.m. (depending on the time of year). The Indian and Pakistani flags are raised at the gate, which wears a peaceful look, during the day. There's a viewing area for visitors, consisting of concrete steps, on each side of the gates. The ceremony is performed by soldiers of the Indian Border Security Force and Pakistan Rangers. It's carefully choreographed, and involves much planning and coordination between the two countries. The soldiers are specially appointed and trained for the performance. Apparently, they are even paid extra to maintain an impressive mustache or beard. The ceremony starts with the formidable marching of soldiers from both sides to the border gates. The Indian soldiers are dressed in tan military uniforms, and are cheered on by spectators shouting “Jai Hind” (Long Live India). The Pakistan Rangers wear a green military uniform and the crowd shouts “Pakistan Zindabad” (Long live Pakistan). The two countries are separated by two heavy gates set a couple of meters apart. The gates are closed well before the ceremony starts in the evening, and are opened briefly at sunset to allow for the flags to be lowered. The ceremony aims to evoke patriotic fervor among the crowd. Some Indians wave the national flag, while others dance to Bollywood songs that blare through speakers. There's always a huge and enthusiastic crowd, and it swells on weekends and public holidays. The ceremony involves some rather amusing theatrics, which even take place as the flags are lowered. Although the flag lowering is complete, the displays of might aren't over. The Indian and Pakistani soldiers carry out an astonishing high kick competition, with legs almost touching their foreheads, to the blaring of patriotic songs and the encouragement of the crowd. Nadeem Khawar / Contributor/Getty Images. The Wagah Border ceremony is finally concluded with a brisk handshake by soldiers from both sides. After the ceremony is over, the flags are carefully folded and carried away to be stored for the night.